Henry John Heinz founded a empire of commercially-prepared foods. Such products provided convenience to housewives, who previously had to make all their home products from scratch. Heinz wasn’t the first to market with such products in America. In fact, imports of British commercially-prepared foods had been underway for several decades before him. The problem was while the imports were a bit pricey, the more affordable domestic American competitors to these goods had acquired in the public’s mind a bit of a dodgy reputation, and housewives just didn’t trust a lot of them. Heinz decided to win their trust by selling his food items in clear glass bottles so you could see what you were getting. This was an innovation. He, and later his son Howard, also introduced defined quality control procedures in his food processing plants, and would even invite people into his factories to see how clean they were and how well-treated his employees were. He parlayed this trust into an empire through his natural marketing and advertising savvy. Heinz ketchup sold in America today is made in Ohio and Iowa. Heinz Baked Beans are such a staple in Britain that some Brits are actually surprised to learn the company is actually American. 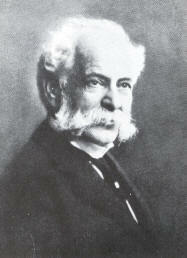 Henry John Heinz was born and died in Pittsburgh, Pennsylvania. Other industrial titans to come from Pittsburgh were Carnegie, Mellon and Westinghouse; Milton S. Hershey came from Pennsylvania as well. The world headquarters of Heinz is still in Pittsburgh, where the company was founded. 1844 — Henry John Heinz was born 11 October 1844 in Pittsburgh, Pennsylvania. His father, Johann Heinrich Heinz, had come to America four years earlier in 1840 from Bavaria. His mother, Anna Margaretha Schmitt, came from Hesse in Germany. His parents spoke German, naturally, and Heinz learnt it from them. His father had a brick-making business. 1850 — The family moved from Pittsburgh to Sharpsburg. 1856 — Henry’s mother made pickles in her basement for sale. He would help make them, and in 1856, at the age of twelve, he started taking them around to sell, along with produce from their garden. At the time, he was also attending Duff’s Mercantile College in Pittsburgh. 1859 — At the age of fifteen, Henry started working in his father’s business and became a partner in it. 1869 — At the age of twenty-five, Henry decided he wanted his own business, and started making and selling pickled horseradish in transparent light aqua green bottles. The transparent glass bottles were a stroke of marketing genius. Before that, products were sold in solid coloured glass bottles or pots that people couldn’t see through. The transparent glass allowed buyers to inspect the product before purchasing. At the time, the bottled good manufactured industry had acquired a bad reputation for using filler, such as turnip pieces, or even wood chips, that you couldn’t see were in the product until you got home. (By 1878, he could afford to switch to the more expensive completely clear glass bottles.) Henry began branching out into pickles, sauerkraut and vinegar, sending shipments to grocers in Pittsburgh. He set up headquarters in Sharpsburg, just to the north of Pittsburgh. A two-storey farmhouse served as both the factory and the offices. (It is now in Henry Ford’s Greenfield Village, Dearborn, Michigan.) He then acquired a partner, L. Clarence Noble, who was a neighbour, and called the company Heinz & Noble. The two bought one hundred acres along the Allegheny River to grow vegetables on, as well as a vinegar factory in St Louis, Missouri, and expanded to larger facilities. 1869 — Henry married Sarah (“Sallie”) Sloan Young on 23 September 1869. They were married at the Methodist Episcopal Church by a Dr Wood, who had delivered a eulogy at Lincoln’s funeral. The couple took a trip to Niagara Falls to honeymoon there for several weeks. The couple would become active in the Lutheran church, and then later, the Methodist church, which better reflected Heinz’s anti-alcohol views. 1872 — Heinz and Noble introduced their ketchups at the Philadelphia fair — one walnut based, and one tomato based. 1872 — Heinz introduces a sweet pickle, sweetened with saccharine. A few years later they switched to sugar as a sweetener. 1875 — December. Credit was still tight in 1875, owing to the Jay Cooke banking panic of 1873, which put the economy into depression until 1879. Throughout 1875, Heinz mortgaged everything he could to stay afloat, but finally filed for bankruptcy in December 1875 owing $170,000, with assets of $110,000. 1876 — Henry restarted business with his Cousin Frederick and brother John, by managing to borrow $3,000. He called it the “F. & J. Heinz Company.” They were listed as the owners until he was discharged from bankruptcy and able to own a company again. 1877 – Heinz first experiments with the use of tin cans, for sauerkraut. 1877 – Heinz yellow mustard, Heinz Dusseldorf mustard and Heinz chow-chow introduced. 1877 – Added mincemeat with suet, actual meat, candied citron and cider vinegar in place of alcohol. It was sold in wooden buckets, stone crocks or glass jars. 1877 / 78 – Added white pickled onions, barrel-fermented for three to four months in salt and pickled in clear, distilled vinegar. 1879 – Introduced a pepper sauce made from red and green peppers. 1879 – The depression ended in 1879. Heinz’s company finally turned a corner and made $15,000 in profit. He gave all his employees a $15 bonus for Christmas, and paid off 12 of the debts from the old company’s bankruptcy. 1880 – Added apple butter and cider vinegar to products. Sometime before or around this time, he introduced chili sauce, mincemeat, olives, and pickled cauliflower. He also went to Germany to visit relatives. He returned to America in 1886 at age of 42. He subsequently introduced for his workers the pay levels, benefits and services that he saw German workers had. 1890 — Tomato Chutney introduced. 1892 — Dill pickles are added to product line. 1894 — His wife Sarah dies, aged 51, on 29 November from various complications including pneumonia. 1896 — Henry opened an office near the Tower of London, his first overseas office. He opened factories to actually make the products in England in Peckham in 1905 and in Harlesden in 1919. 1896 — Henry came up with the slogan “57 varieties.” He was 52 at the time. The number “57” in the slogan “57 varieties” was just a number he made up. 1897 — Cream of Tomato Soup is added to the product line. 1897 — Heinz tries to produce ketchup at the Holland, Michigan, plant, but poor tomato yields caused the plant to producing pickles and vinegar instead. 1898 — Heinz Tomato ketchup is added to the product line, being made in the Muscatine, Iowa, plant. 1941 — Howard J. Heinz II (Jack) became president of the company. 1958 — Up until 1958, all growth was actual growth in the company, as opposed to buying out competitors. In this year, they started acquisitions. They bought a food processing operation in the Netherlands, and then acquired companies in America, Mexico, Italy and Portugal over the next few years. Skrabec, Quentin R. H.J. Heinz: A Biography. Jefferson, North Carolina: McFarland, 2009. Page 49. Alberts, Robert C. The Good Provider. American Heritage Magazine. February 1972. Volume 23, Issue 2.